This document describes the various document capture methods used by Perceptive Content imaging software. In Perceptive Content imaging software, you can collect files manually or automatically from a centralized location or distribute the capture of documents to different locations. You can capture all types of documents, individually or in batches, into Perceptive Content's secure, organized, and accessible repository. Scan a document individually using the Single Mode capture method. Scan multiple documents simultaneously using the Batch Mode capture method. Scan or update baskets of documents using the Package Mode capture method. Each method allows the options of bypassing Quality Assurance (QA), by sending documents directly to a workflow queue and setting the document index keys automatically. You can use the Single Mode capture method to import one or more electronic files into Perceptive Content. The Single Mode capture method creates a single document. As a prerequisite, Single Mode requires a capture profile set to File source and Single mode. When you use a Batch Mode capture method to import one or more files, Perceptive Content creates a new batch. You quality assure and assign the location and property values to files in the batch later in your business process. 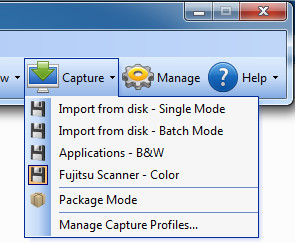 As a prerequisite, Batch Mode requires the capture profile set to the File source and Batch mode. Package Mode is a method used to import a package of files into Perceptive Content imaging software. You can import a package of files and assign property values using an Application Plan. As a prerequisite, you will need to create a capture profile set to Package Mode and File source, and a LearnMode Application Plan with the ability to assign document property values.